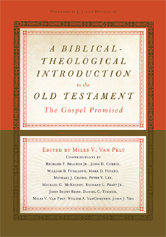 Editor: Van Pelt, Miles V.
Covering each book in the Old Testament, this title invites readers to teach the Bible from a Reformed, covenantal, and redemptive-historical perspective. Featuring contributions from twelve respected evangelical scholars, this gospel-centered introduction to the Old Testament will help anyone who teaches or studies Scripture. 15 Job Richard P. Belcher Jr.
19 Ecclesiastes Richard P. Belcher Jr.
22 Daniel Richard P. Belcher Jr.
24 1–2 Chronicles Richard L. Pratt Jr. Appendix A: The Seventy Weeks of Daniel 9 Richard P. Belcher Jr. Appendix B: The Role of Heavenly Beings in Daniel Richard P. Belcher Jr.